The condition commonly described as "fluid on the elbow" is medically referred to as elbow bursitis. A small sac of fluid that sits between the tip of the elbow bone and the skin, the bursa allows the skin and bone to move freely against one another. When the bursa becomes irritated, it fills with fluid and becomes extremely painful. Pressing gently on the back of the elbow allows you to feel the liquid inside, hence the condition's popular nickname. Understanding the relationship between weight lifting and fluid on the elbow can help you prevent the painful condition. Elbow bursitis can be caused by a variety of factors, from injuries to infections. Among these, prolonged pressure and trauma are the most common causes. A direct hit to the tip of the elbow may cause the bursa to produce excess fluid, resulting in bursitis. 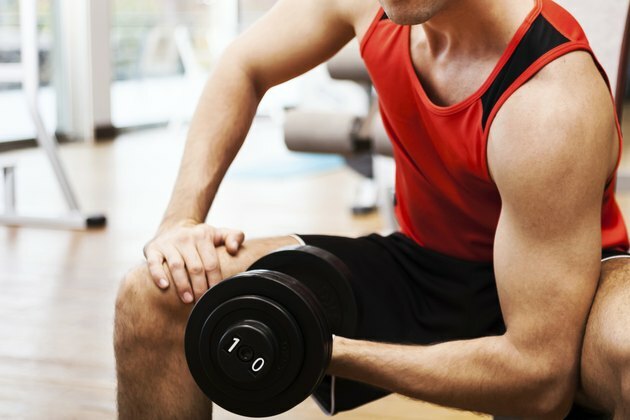 Although direct elbow trauma is not common with weight lifting, it could occur if you accidentally bang your elbow against a weight, machine or exercise bench. Similarly, prolonged pressure on the tip of the elbow can also cause swelling of the bursa. Spending excessive amounts of time resting on your elbows while lifting weights could eventually result in elbow bursitis. Occasionally, bursitis might also be caused by an infection. If the back of the elbow is scratched or punctured, bacteria may enter the skin and infect the bursa. When an infection sets in, the bursa swells quickly and the skin often becomes warm and red. Since multiple people use gym equipment every day, the exercise machines, weights and benches may harbor dangerous bacteria. Prevent infections by covering any skin scratches or punctures before using the shared equipment. As with any medical condition or injury, consult a physician for the proper treatment required for your specific condition. In many cases, elbow bursitis simply needs rest and time to heal. Until the bursitis heals completely, avoid using the elbow and keep it elevated above your heart as much as possible. Apply ice to the area for 20-minute sessions every four to six hours. If you do not have an ice pack available, use a bag of crushed ice or frozen vegetables. Ice not only numbs the area to relieve pain, but also decreases inflammation and swelling. Your doctor might also recommend wrapping the elbow with an elastic bandage to further prevent swelling. She might also prescribe an antibiotic, anti-inflammatory and/or steroid medication. Although elbow bursitis can certainly occur as a result of improper or excessive weight lifting, it is not the most common elbow injury related to the sport. According to an article published in "American Family Physician," the most common elbow injuries associated with weightlifting include biceps/triceps tendinosis, anterior capsule strain, ulnar nerve entrapment and radial tunnel syndrome. Elbow bursitis, on the other hand, is most commonly associated with the sports of football, basketball and wrestling.